In a medium size pot cover parsnips with water. Bring to a boil and cook parsnips for about 10 to 12 minutes or until soft (timing will depend on the size you cut the parsnips). Drain and set aside. In the same pot combine the coconut milk, garlic, thyme, and bay leaf. Simmer coconut milk for about 5 to 10 minutes to infuse the coconut milk with the flavor. Remove from heat. Add parsnips to a blender and strain half of coconut milk into the blend. Blend on high adding the remanning coconut milk to reach desired consistency. Warm coconut oil over medium high in a large cast iron skillet. Cook scallops for 1 to 2 minutes each side or until golden brown, working in batches if needed. 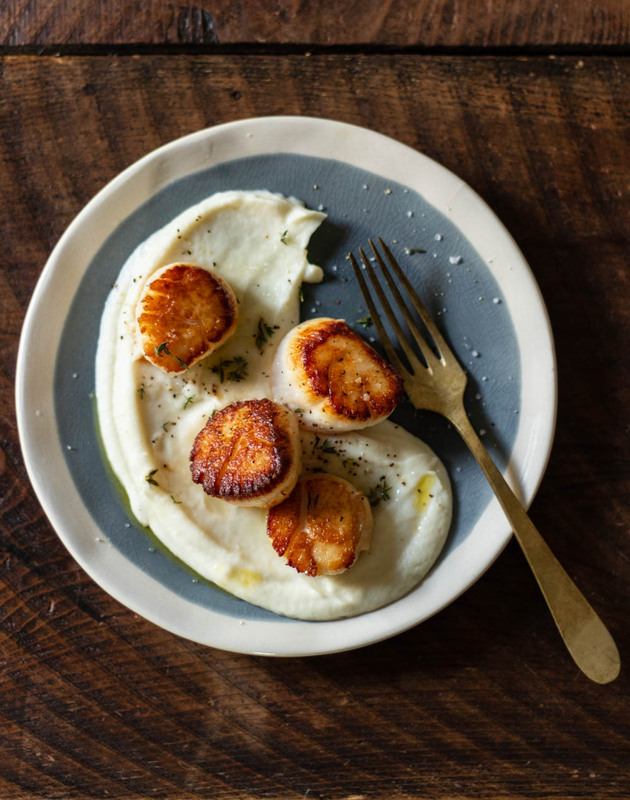 Serve scallops warm with a large dollop of parsnip puree and a sprinkle of salt and pepper.